The tours aim to help with completing a project on “orientations to refine institutions and policies to raise the quality and efficiency of attracting and using foreign investment till 2030” that will be submitted to the Political Bureau. According to Deputy PM Hue, FDI contributed 13.6-14 percent of Vietnam’s State budget and around 20 percent of GDP. FDI has helped increase investments for development; improve production and growth in prioritized sectors; sharpen the national economy’s competitiveness; speed up economic shifting; renovate technology and equipment; boost export strategy; and create jobs for labourers. Chairman of the Hai Phong People’s Committee Nguyen Van Tung said the draft project needs to make deeper analysis of new circumstances to draw foreign resources. He raised difficulties facing the city during the process of attracting foreign investment, including the management of foreign investors and the making of mechanisms that conforms to international norms while ensuring the efficiency of State management. He suggested adopting strategies and planning schemes in which foreign investment have to meet requirements on environmental protection, protect labourers, ensure social interests, and bring in high technology. FDI has accounted for over 30 percent of total development investment of Hai Phong. In 1993-2018, industrial zones and the Dinh Vu-Cat Hai Economic Zone have attracted 311 FDI projects with total registered capital of 13.58 billion USD. 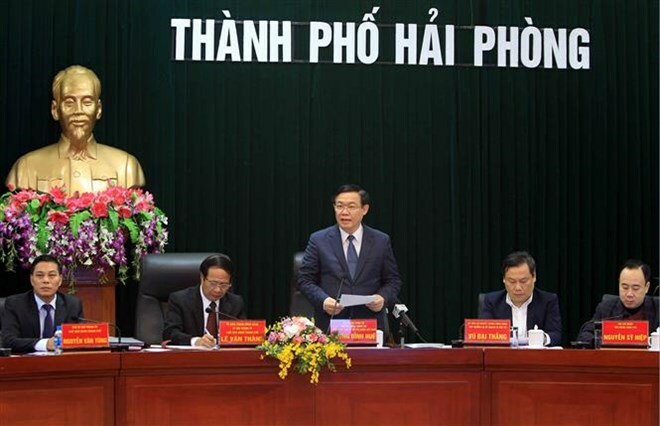 Meanwhile, Chairman of the Bac Ninh province Nguyen Tu Quynh proposed the Government soon amend the laws on investment, enterprises, construction, housing, land, environmental protection, intellectual property, and bidding towards unifying regulations on authority pertaining to deciding investment plan, approving investment plan and approving projects to enable localities to carry out administrative procedures smoothly and save time for businesses. As by 2018, Bac Ninh had lured about 1,300 FDI projects totalling 17.2 billion USD, ranking sixth in the country. Most of the projects went to the manufacturing industry, which accounted for 92.8 percent of the investment capital. So far, 34 countries and territories have invested in the province. Deputy PM Hue said trade agreements joined by Vietnam are offering new opportunities and foreign investors expect that policies in the country would be consistent and implemented stringently. The tours will help perfecting mechanisms and policies on attracting and using FDI till 2030 for the National Assembly to revise the Law on Investment and the Law on Enterprises, and also for providing a basis for the Political Bureau to issue a themed resolution on foreign investment, which will serve as a guideline on the role and position of foreign investment in the country, he said./.